Foodista | Why You Should Eat Greek Yogurt! Why You Should Eat Greek Yogurt! Greek yogurt has a lusciously thick and creamy texture and rich taste, but those aren't the only qualities. Did you know that it has twice the protein (which helps you feel full and satiated) than standard American-style yogurts? And the health benefits go on! It's been minimally processed, so it maintains healthy bacterias such as acidophilus and lactobacillus organisms, both of which help improve intestinal health. Greek yogurt has more calcium than most yogurts. 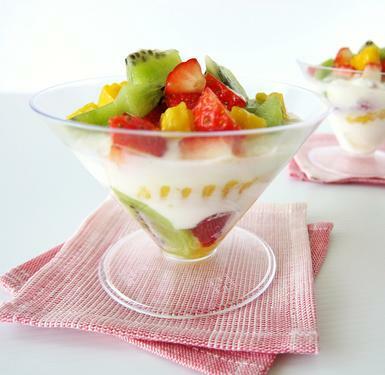 Due to the live active cultures in yogurt, calcium is more easily absorbed by the body. A 6-ounce serving of Greek yogurt provides nearly 20% of your daily calcium needs. Because the whey is strained off multiple times, thus creating its thick texture, much of the natural sugar is removed. In fact, Greek yogurt has half the sugar as unsweetened American-style yogurt! Healthy Substitute for Sour Cream! It won't curdle at high temperatures, so Greek yogurt makes for a great substitute for sour cream in baked dishes and on top of baked potatoes! I agree that Greek yogurt is great. And I love to make my own by straining plain yogurt. However, not all of your facts are right. For instance, Greek yogurt typically has LESS calcium than regular yogurt. It's indeed higher in protein, but the calcium is lower. A 6-ounce carton of plain, non-fat is typically 30% DV calcium, where the Greek-style is 20%. And there's still lactose in Greek yogurt, so I'm not sure what you mean that much of the natural sugar has been removed. Anyway, thought you'd want to know. But agree, that Greek yogurt is a welcome newcomer in the dairy aisle! It's also way more expensive, and ridiculous to buy it when you can make it at home. Take some yogurt with a good spread of bacteria, plop it onto some paper towels lining a strainer or sieve, and let the whey drip out for a while. When it's thick enough plop it back into the container, and there you are, thick as real sour cream. If you let it drain longer you will have something like cream cheese. I do this all the time, though I make my own yogurt these days. Have used the "cheese" to make cheesecake - wonderful!